WINTRADE WEEK is the UK’s largest independent event focused on the state of enterprise and international trading. WINTRADE WEEK is designed to help business executives cut through the red tape of trading nationally and internationally, and learn how to trade to build a competitive advantage, drive new business opportunities, reduce costs and accelerate innovation efforts. WINTRADE WEEK is the “must attend” event for enterprise executives and decision makers from global organizations. The 5–day conference brings together the international small business ecosystem, including innovative enterprises, industry thought leaders, start-ups, investors, developers, independent researchers and leading solution providers. Meet new friends for life! Our theme is “Womenonmics, – Accessing, finance, contracts, trade, support, advice and guidance”. There is a myth that women are expert networkers, but leave without the contract. We will also take this opportunity to celebrate the 100th anniversary of the Parliament (Qualification of Women) Act 1918, allowing women to stand for election to the House of Commons. WINTRADE will bust this myth and show that women don’t need the boys club to do business, but are just as effective whenever the opportunity shows up. The convention will also discuss success stories, best practices and key challenges and solutions that face Women Entrepreneurs in a globalized world. The Convention will stand to motivate, inspire and encourage boldness, ambition and leadership. 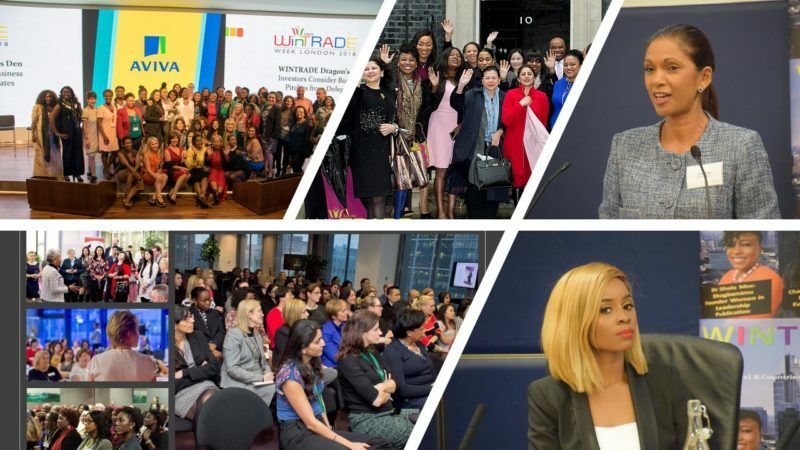 WINTRADE (Women In Trade), is a network that serves to bridge that gap, break down barriers and give ease of access between Women entrepreneurs globally to facilitate the development of small and new businesses. This is where you will be able to solidify friendships, network and contract with like-minded women business leaders to transform ideas to action. If you work hard to earn a living and want your business to be more independent and financially free. Whether you have a startup or want a startup, you can hear many stories from others who have launched their own startup and achieved success. Your biggest challenge is that you don’t want to waste time trying to grow through trial-and error and don’t know what the best strategies to leverage your time most effectively. WINTRADE WEEK workshops will help you find specific strategies that will fit in with your values and and life vision, and make sure you don’t waste time or money down the wrong path. If you’re the owner of a consulting business or maybe you’re an artist or graphic designer who works freelance, or maybe you run a publishing business and employ a small team. No matter what industry arena you play in, if you’d like to increase your revenue, gain new customers and deepen customer relationships without increasing the time spent in your business, WINTRADE WEEK WORKSHOPS will give you actionable ideas to walk away with and implement. CORPORATES WANTING TO INCREASE BUSINESS TO NEW AUDIENCES AND NEW NETWORKS. If you are a corporate business development manager and looking to expand your audience, your market and your business networks and your biggest problem is that you are unsure what the most effective ways for you to grow your business and still retain your time, sanity and credibility – then this is the place for you. You know need to upgrade your team, technology and business opportunities, but you’re so busy you simply don’t have the time; WINTRADE WEEK WORKSHOPS will give you the solutions you need that you can implement straight away to get you back on track as soon as you get back to your office. The convention program is focused on helping your company to understand where to find the right trading opportunities. Learn from enterprise and innovators how they are harnessing their national and international opportunities. Walk away with a special report from on how to deploy your own business trading strategy. You can choose to stay with us at the Park Plaza Westminster Bridge London Hotel. We have negotiated a group discount, bringing the cost/night in a shared double room to 80£ pp.